A reporter from the Palestinian Centre for Human Rights describes a little of the suffering of one family whose house has been made rubble. PCHR, led by Raji Sourani, has been in the forefront of those who demand justice for the Palestinian people. In this new series of personal testimonies, PCHR looks at the aftermath of Israel's 22 day offensive on the Gaza Strip, and the ongoing impact it is having on the civilian population. Three weeks after the Israeli offensive on the Gaza Strip, 16 year old Maysa al-Louh sits stoically on the pile of sand that consumes half her home in Beit Lahiya. 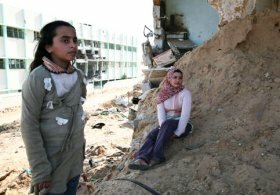 Under the sand, churned up by Israeli bulldozers during incursions into this area on 4 January 2009 lie all her report cards and school awards that were testament to her excellent academic record. Nearby her grandmother tries to heat water on a pile of ash. The smell of decomposing chicken carcasses is overwhelming: the family's chicken coop that provided them with eggs, as well as their vegetable garden, were all destroyed by the bulldozers and tanks. Thirty five people lived in the three storey al-Louh house. The contents of home life - a refrigerator, notebooks, framed pictures, and plastic flowers, lie scattered over the area. The adjacent Sakhnin Elementary School was also damaged by artillery shells and some of its classrooms are now a masse of mangled chairs, steel rods, shattered concrete and broken glass. Israel says militants were firing rockets from the school grounds. Najat is three months pregnant with her eighth child. Her youngest daughter Sara who lies listlessly nearby, has been unwell for days, with vomiting and a high fever. They have been unable to get her to a doctor.